Thursday 29. June 2017 - Multi Packaging Solutions (MPS) is a leading manufacturer of print-based specialty packaging for the healthcare, FMCG, horticulture and media end markets. The business operates manufacturing facilities in North America, Asia and Europe, with approximately 9,000 employees worldwide. A group of machine operators from MPS Nottingham was one of the first to undertake a new, comprehensive multi-tiered training program delivered by Bobst UK & Ireland Ltd.
MPS Nottingham is keen to ensure that employees, at all levels, feel valued and understand they are an important part of the business and its success. 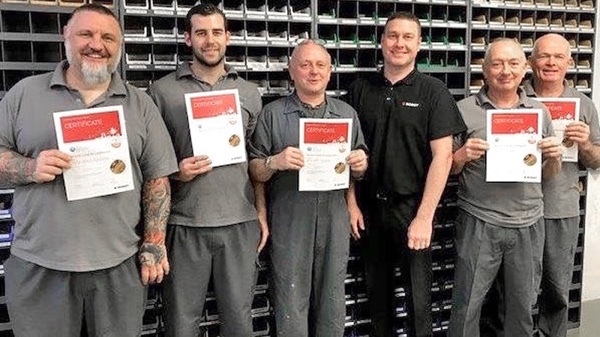 Bobst UK & Ireland Ltd and MPS Nottingham have a long-standing supplier/customer relationship and MPS Nottingham felt confident that BOBST would deliver a training program that would not only get the best from its machinery, but more importantly, bring out the best in its people. The Nottingham plant wanted to set a benchmark for all die-cutting machine operators so that there was a clear base level of skill and knowledge followed by a well-defined structure of progression and achievement. A key objective of the training was to identify the strengths and weaknesses for each machine operator so that they can develop their technical skills not just in the training classroom but when carrying out their day-to-day roles. In total, 14 machine operators from cut and crease backgrounds undertook training at bronze level. The training covered BOBST die-cutters for folding carton. The new multi-tiered training program is structured into bronze, silver and gold so that it can cater for all machine operator abilities and skill levels. Training took place on site at MPS Nottingham, led by Andy Harris, die-cutting Product Specialist in Folding Carton for Bobst UK & Ireland Ltd. Each machine operator’s skills were assessed over the course of a day to identify gaps in knowledge following a mix of theoretical study and hands-on training – carried out on the machines they use on a daily basis with real-time jobs. The results of these assessments then generated an individual training plan for each operator. The multi-tiered training program has been designed to give operators a deeper understanding of safety awareness and the factors around obtaining higher productivity, minimizing unscheduled machine downtime and reducing set-up time. Scott Marshall, Cut & Crease Manager at MPS Nottingham, said since the multi-tiered training program took place there had been an increase in machine output and, in what was already a very lean department, a small reduction in make-ready times. Mr Marshall added: “These results are very good for us – we already had a very lean operation in place so to take out further time is an excellent result.